I’m happy to say that my teenage acne has virtually disappeared since I’ve entered by 20’s. However, I’m still plagued by dark marks,and indented acne scars. They’re unsightly and definitely reduce my confidence. I’ve previously tried a number of products without much success. Most were designed to treat only raised scars. 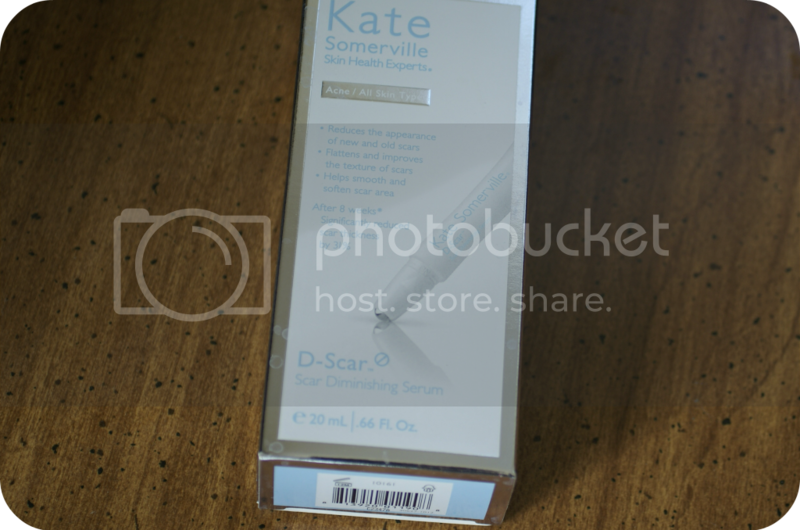 However, I was thrilled to discover Kate’s D-Scar is effective towards a wide range of problems. The product claims to deliver results in around 8 weeks. I’ve been using it for around 4 weeks. RollerBall Application:I like being able to massage the product into my face, with the cooling tip. Packaging: I’ve used several rollerball products before mostly on my eye area. LOVE LOVE LOVE that this one has an on/off switch. If you’re using it you just slide it to on, and squeeze the product out.However, if you want to travel with it, just set it to off to make sure nothing comes out. Moisturizing: The serum a smooth, offwhite cream. I like that it’s moisturizing, and not at all drying/irritating. Effectiveness: When wearing foundation I deal with the dreaded “crater face”. My scars will soak up a ton of the product, and makes the holes 10x more noticeable. While I haven’t seen any chances in my bare skin, I am noticing that makeup is not settling into my scars as much. I think this is due to the serum building them up, while also smoothing the area around it. I wish the product was bigger, or available in a bigger size. Using only a few drops a day the .66 oz. is not stretching as far as I’d like. Sephora and Nordstrom for $45! Disclaimer: Baking Beauty received a Kate Somerville sample. All opinions are my own. THANK YOU for your honest opinion. I had major issues with acne growing up and really need something to make the marks go away. And I love that it’s available at Sephora! I could DEFINITELY use this right about now! I recently had surgery and even though it was minimally invasive, there are still some scars left over I’d love to nip in the bud. It is a little expensive for such a small amount. I guess it would be ok if went further! Great review of the product! Thanks for this review! I have acne scarring and a surgical scar on my face that are horribly noticeable. I will have to check this product out! This would be great if it worked on surgical scars. I have one on my back that I would love to have diminish. Great review. Thanks for sharing. I have a friend whose daughter just had surgery, I will share this with them. I would so love to try this! I have a small scar from where I busted my chin open when younger. Thanks for the review, I will have to try it out as I have a few scars I certainly wouldn’t mind getting rid of. I have a few acne scars from the teenage years that need some help coming off. Should give this a try! I have a scar on my face, dog bite, that I could do without. But honestly, $45 for only .66 oz is too steep of a price for me. OOh – I haven’t seen this one yet. My son has a scar on his face and I should definitely grab one and see how it works for him. I’ll have to check this out. I have a few scars I’d love for it to help diminish. i have heard great things about this brand and would love to try some of their products out!